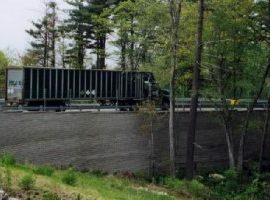 We specialize in the design of earth-reinforced segmental retaining walls for commercial, industrial, and residential sites throughout New England and New York. Our services include quick turnaround of designs and personalized service. 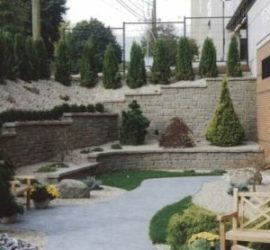 Take a look at some of the retaining wall projects we have designed and contact us if you’d like to discuss your specific project needs. 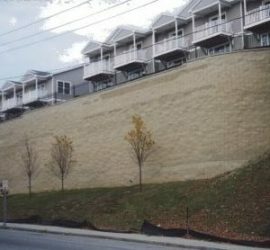 We have been designing earth-reinforced segmental retaining walls since 1994. In that time, we have designed over 5,600,000 square feet of walls, and are now averaging over 700,000 square feet per year. Our designs have included walls as high as 45 feet and as long as 1000 feet. One wall was over 19,000 square feet by itself! Take a look at some of our previous wall projects. You can also find links to some of the segmental retaining wall manufacturers.